Anorexia nervosa is a restricting type of eating disorder that involves an unhealthy, severe reduction of food intake due to body dissatisfaction and extreme concern about weight. 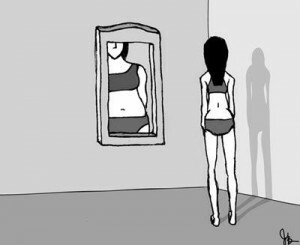 Individuals with anorexia nervosa see themselves as overweight even though they are dangerously thin. Women are more likely than men to develop an eating disorder and approximately 0.5 to 3.7 percent of women specifically suffer from anorexia nervosa in their lifetime. It is the most common cause of death among young women. The mortality rate for anorexia is 0.56 percent per year, which is about 12 times higher than all other causes of death among females ages 15-24 in the general population. The course and outcome of this eating disorder vary across individuals; some individuals can fully recover after a single episode but some experience a continuing deterioration from this illness over years. Individuals with anorexia repeatedly check their body weight, avoid eating food or eat food in tiny quantities, and engage in various techniques to control their weight, such as intense exercise or abuse of laxatives. Adolescent girls with anorexia experience amenorrhea, which is an absence or delayed menstruation. An early diagnosis of anorexia nervosa can increase a successful outcome of treatment and medication should be considered after a healthy weight gain has been reached. Certain SSRIs (serotonin reuptake inhibitors) have been helpful for weight maintaining and resolving mood and anxiety symptoms for this disease. Once individuals with anorexia have gained weight and malnutrition has been restored, psychotherapy can help them overcome deeply-rooted self-esteem issues and body image distortions.